With something like 1 million images in its files, boxes, drawers and stacks, the Palace of the Governors Photo Archives has a tough time keeping up with knowing what’s what. Often, we rely on volunteers to help us identify who’s who, which mountain is which or whose hand opened the shutter in photos that arrive with little documentation. Sometimes, our Facebook fans help out. Lacking such knowledge, the images are known are “orphans.” Tonight, the Matthews Gallery on Canyon Road opens a new exhibit, Familiar Strangers: Vernacular Photography (through May 23), dedicated to celebrating unknown photographers whose works are as haunting as those from “celebrity” shooters. We have a set of collections that exist in this limbo land between the old cataloguing system and the new cataloguing system. We might know something about them, or they might just be a box of photographs sitting on a shelf. This box says “Forrest Fenn“, so he probably donated them. Some have a photographer’s name on the back and some don’t. 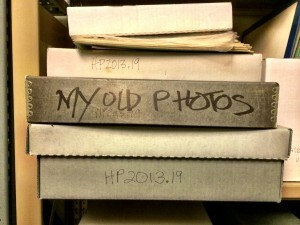 The stack of files is catalogued by location or subject— “New Mexico Towns” or “Portraits”. There’s more; it’s a great interview. Give it a read here.